We design our private-label mattresses just like we design the rest of our products: with a focus on American-made quality and the solutions you need. 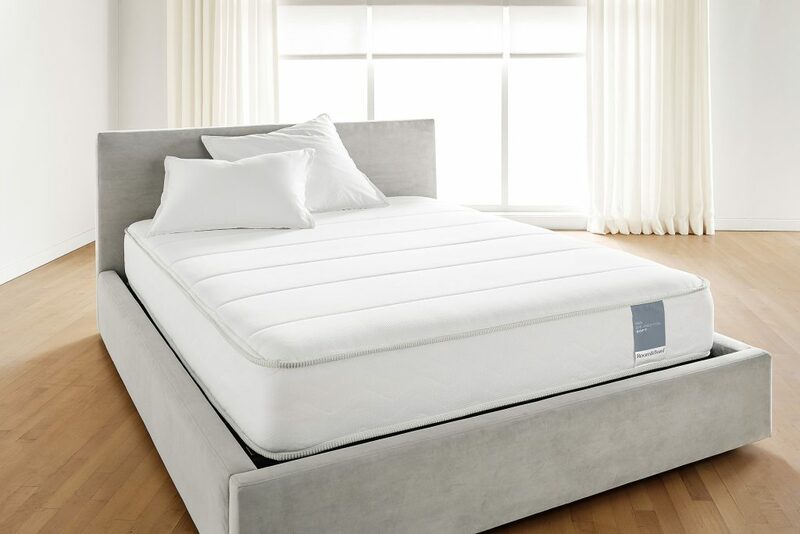 Our direct relationship with a U.S. mattress manufacturer means that we are able to provide not only a better value than the national brands but also superior quality and material safety. We’ve been selling mattresses this way for years, but we just refreshed our offer to make it easier than ever for you to find your ideal mattress. Try your new mattress for up to 120 nights. If you decide you want to exchange it for a different mattress or simply return it, we’ll come to your home to swap it out or pick it up for free. Few mattress brands offer this much time to decide or the convenience of a free, full-service exchange or return. So why do we? Simple. We think you deserve to love your mattress. We’ve renamed our mattresses by type and comfort to make it simpler to understand your options. Regardless of which mattress type you’re considering (innerspring, encased coil, or memory foam and latex foam), soft means soft and firm means firm. Look for our new comfort icons on each mattress product page. With our wide range of choices, there’s something to suit any comfort preference. We’ve made it even easier to compare our mattresses side by side. 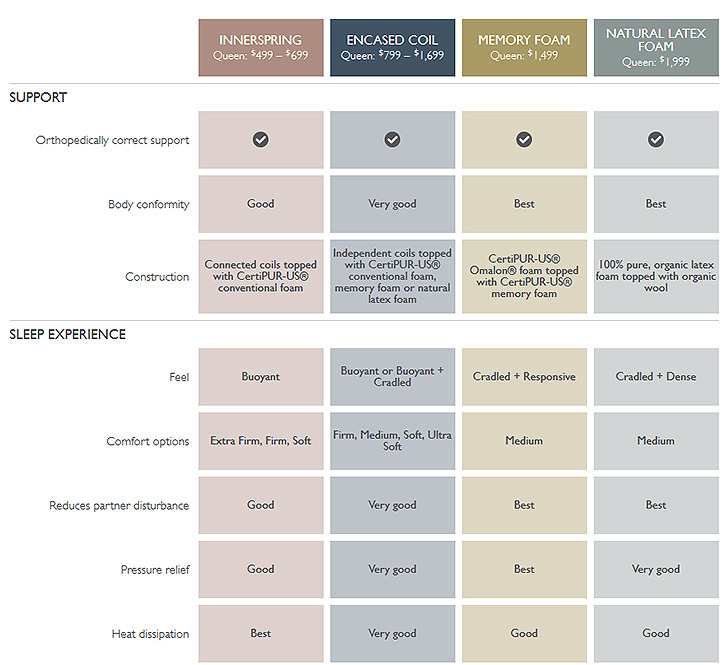 Compare the benefits of our four mattress types (below), or compare all 10 of our mattresses by comfort with our new mattress shopping guide. Our sleep trial and straightforward options are only the beginning. We make our mattresses with integrity and back them up with honest, convenient service. Our mattresses are made in Minnesota, just 11 miles from our headquarters. The experienced team at Restwell takes great pride in their meticulous craftsmanship, and we’ve trusted them to be the exclusive manufacturer of our private-label mattresses since 1999. We use only the safest materials in our mattresses. No mystery foams or unknown fillers. Just organic cotton covers, CertiPUR-US®foams, organic latex, recycled steel springs and absolutely no flame retardant chemicals. Every mattress is designed to align your spine for proper orthopedic support. That means you can simply choose what’s most comfortable for you, knowing you’re getting the support you need to sleep soundly. People often tell us that buying a mattress feels overwhelming, with so many options to consider and pushy salespeople to manage. If that’s how you feel, shopping for a mattress with us will be a breath of fresh air. Our non-commissioned Design Associates will never pressure you to buy. There’s no need to bargain either, thanks to the fact that we guarantee our prices for a year. So take your time, get comfortable and let us help you find the right mattress. Our full-service delivery is just $89 for those within 100 miles of our stores and only $129 anywhere else in the contiguous United States. This rate is for unlimited items. That means if you’re ordering a bed to go with your mattress or other furniture, everything arrives at the same time. We take care of any assembly, remove all the packaging and even dispose of your old mattress and box spring if you want. It’s just one more way we help you rest easy. Check out our new mattresses online or visit the redesigned mattress rooms in our stores.